I began knitting this hat for a dear friend. Her third boy is due in a few weeks. I thought that this would be a good little hat for a boy but after completing it the hat seemed to take on a different feel. I think it will do fine for a boy or a girl but it's just not right for this boy. Isn't that funny? With knitted projects they seem to have a feel of their own. Despite best intentions sometimes those projects just are not meant for who I had in mind. The good thing about baby hats are their size. Being small makes them easy to knit up. Not only that but I do love making baby hats especially when I know they are going to be given to a special little person. This beanie is a great hat but I've decided I need to make a different hat for boy #3. 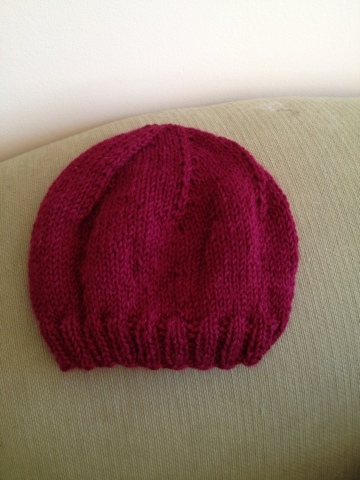 Although when I think of a hat for boys I seem to always select my simple ribbed hat pattern. For boys that style seems more timeless. It's simple but durable. Since this beanie hat is not going to be for boy #3 maybe I can get little Adelynn to wear it this winter. It fits her perfectly for the 10 seconds she allows me to leave it on her head. And that's not even long enough for a picture! One of these days I'll get a picture of her wearing one of my knitted hats.